Results have shown in a survey conducted by PwC in 2017, that 54% of women and 45% of men research a company’s diversity and inclusion policies before accepting an employment offer. Furthermore, 48% of men and 61% of women investigated that specific company’s leadership team before accepting. These numbers surprisingly increased when conversing with minorities. Implementing diversity in your business is a critical step for growth. There is enough evidence that shows having a diverse company leads to greater creativity and success. 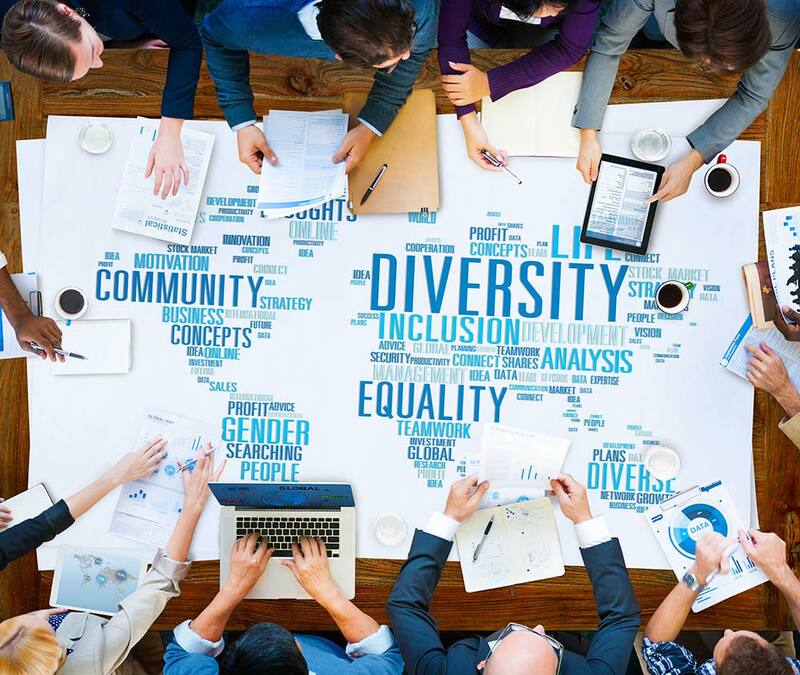 Along with programmes and groups that you can create which are beneficial, what other benefits of diversity are there that can give your company an extra push? One of the first benefits of diversity isn’t just about gender, age and ethnicity, to be more innovative you must think about getting the most out of having different perspectives in your team along with information processing styles. Having a team from different backgrounds with different skills and experiences means the ideas generated will be diverse. Essentially, it is beneficial to play on every workers strengths to provide innovation in your workforce. However, it is vital that you create a relationship with your team to foster psychological safety to ensure they can voice their different views. It has been found that employees who think their organisation is committed to improving and supporting diversity, increases they ability to innovate by 83%. Having cognitively diverse perspectives in your team can help with problem solving and out of the box thinking when challenges rise. According to the Harvard Business Review, teams who are cognitively diverse solve problems faster than teams who are cognitively similar. Diversity encourages individuals to feel comfortable sharing their ideas and perspectives on situations. For example, if you were to have a team of 10 men and 1 woman, the woman might not feel comfortable enough to share her ideas and remain silent due to a sense of being outnumbered. Therefore, it is ideal that you create a working environment with a diverse team, to increase performance. Another benefit of diversity is making it easier to recruit individuals and reduce employment turnover. Whilst every member brings an inclusive culture to an organisation, it is down to the day to day manager who has the power to make employees feel like they belong. Company initiatives are a great way to provide diversity culture in the business, but it’s the managers who build trust, develop opportunities and values the difference each employee brings to the team, it’s the little things that matter the most. An inclusive workplace can create positive word of mouth for people you want to hire and develop. The cost of hiring and training a new worker is around 20% or more of a person’s annual salary. Avoiding turnover also gives a powerful message about your culture. Organisations are starting to realise that the benefits of diversity don’t just affect their employees, but their customers too. 49% of employers stated they focus on diversity to better their customers. No matter your product or service, diversity exists in your customer data base and is growing continuously. Customers can reach and interact with you from different cultures around the world because of the increase in tech. So, having a diverse workforce can enable you to interact and build strong relationships with a broader range of customers. Diverse teams can understand different segments of the market due to the different backgrounds and thought processes they provide and have the potential to open new ones. This also provides companies with the ability to increase their customer base due to the understanding of different cultures.